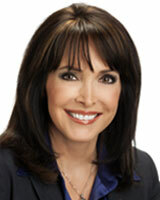 glo Beauty Blog | Makeup How-to's & Skincare Tips: Ellen Leyva for ABC7 Eyewitness News. Los Angles Makeover! Ellen Leyva for ABC7 Eyewitness News. Los Angles Makeover! "I’m actually on the set during the news. Samrah was helpful and informative! I really like how she did my makeup and I’m wearing it on the air right now. She wrote down the colors she used on me and gave me some great tips!...I really loved your products, so thank you again!" So what did she do? Follow along below to find out! Samrah began the makeover with our wonderful collection of HD ready foundations - Ellen used gloPressed base in golden medium and golden dark gloProtective liquid foundation in the Satin II formulation, plus natural gloConcealer - undereye for extra coverage. To play up her eyes, gloBrow powder in brown, gloPrecision eye pencil in black, and our gloSmoky eye kit were used. For cheeks, a pop of gloBlush in papaya warmed her skin tone perfectly! To finish the look and give her a polished appearance on-camera, Samrah filled in Ellen's lips with redwood gloPrecision lip pencil, and topped it with gloGloss in lily. A spritz of gloMoist hydration mist softened the minerals and set her makeup for the rest of the day!